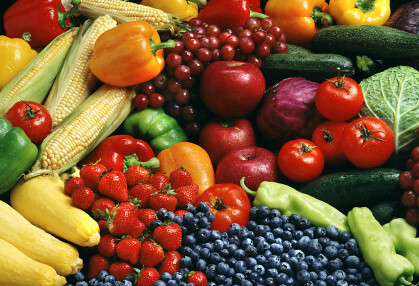 1) Eat at least 7 servings of fruits and vegetables per day. They contain antioxidants like beta-carotene, vitamin C, and phytochemicals. Choose a wide variety of colors, as each color has different nutrients. For vitamin C and betacarotene, choose lots of orange products: squash, carrots, yams, cantaloupe. 2) Choose organic produce, as it contains more phytochemicals than conventionally grown produce. Phytochemicals can act as antioxidants, boosting your immune system and fighting free radicals. One theory behind why organic produce contains more phytochemicals is because the plants naturally need to defend themselves against pests without pesticides, and phytochemicals may help to do this! Of course any fruit or veggie is better than no fruit or veggie at all. Non-organic produce is very nutritious too – so eat up! 3) Probiotics are healthy bacteria that help make the intestinal environment strong. They are showing promise in boosting the immune system, as a large part of your immune system is located in your intestines. Eat yogurt daily, or supplement to get probiotics every day. 4) Some researchers link low levels of vitamin D in the winter, to increased rates of winter viruses. In a large study, people with the lowest blood vitamin D levels reported having more colds or cases of the flu. Vitamin D is not widely distributed in our food supply, but can be found in fish liver oils, fatty fish and fortified milk. I recommend everyone take a Vitamin D supplement in the winter: about 1000IU for adults and 400 IU for children daily. 5) All types of tea may boost your immune system. Also make sure you get enough fluid period – preferably water. Offer children water throughout the day and up to 2 cups of milk and maximum ½ cup of juice per day with meals. There are also certain things to avoid in your daily diet, as they can reduce your immune system’s ability to fight off viruses. These include: alcohol, sugar and trans fat. So here’s to a happy & healthy winter for you and your family! This entry was written by Melissa, posted on November 28, 2012 at 11:18 am, filed under Wean News, Wean Team. Bookmark the permalink. Follow any comments here with the RSS feed for this post. Both comments and trackbacks are currently closed.